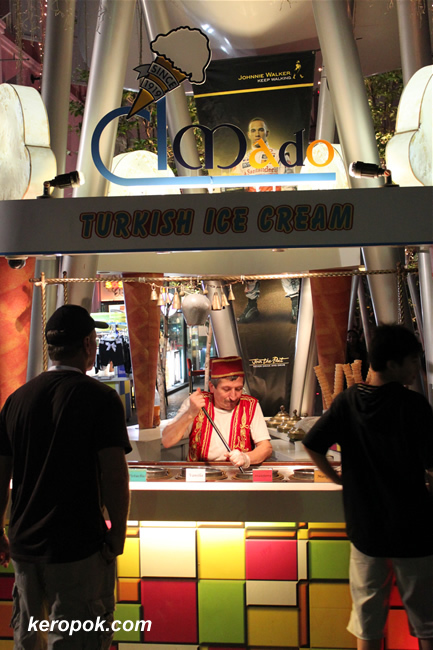 One of Clarke Quay's so called "little entertainment attraction" is the Turkish Ice Cream man's fiddling with the ice cream that he sells. It's like a mini acrobat display! I always enjoy seeing turkish ice cream man performing, like one moment you are holding the cone, the next moment it's gone! i tried before...he is so cute..
he's great around the kids. makes the ice-cream treat more appealing! may i know what time does the ice cream starts selling? Probably in the evening. I am not very sure.